Every year, parents and children seem to feel the first day of school quickly approaching. There’s that strange month between the ease of family vacations and the hectic rhythms of school mornings and homework. Parents go through the school supply checklists and make their shopping trips for binders and shoes and pencils. Our children realize that they have grown out of last year’s clothes, and need new shoes. Then, in the midst of all that energy, some children begin to experience anxiety and dread. 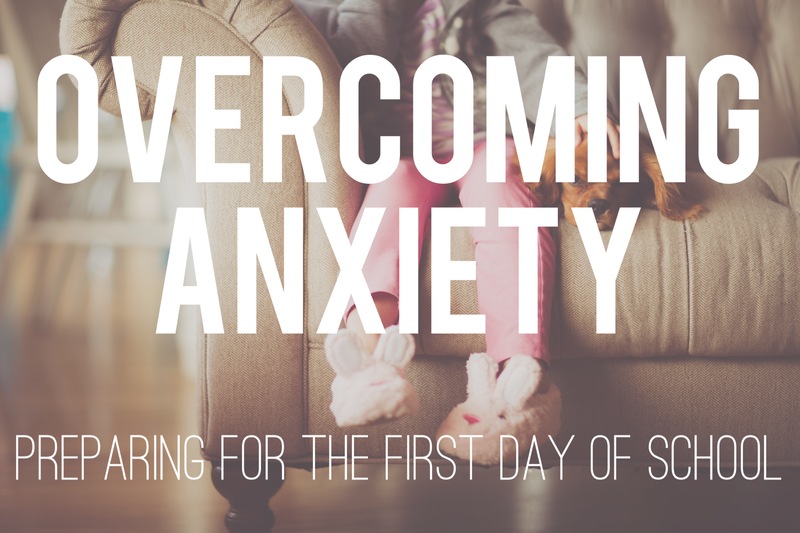 This is because they feel the anxiety of the first day of school coming closer and closer. You try your best to keep things positive with your kids. “You’ll have Ms. Henderson as your teacher this year.” “Let’s go get you some new clothes.” “So, are you excited to see Taylor and Kaylee again?” But then your child starts to have stomach aches, and has trouble sleeping. As best as they try, you see that they start shutting down at the very idea of school. How Can You Tell if Your Child Has Anxiety? A general fear and avoidance of many aspects of ordinary life. Reluctance to ask for help when they encounter problems. Difﬁculty joining in class discussion or social games. Anxious behaviors are created by anxious thoughts. While parents may be concerned by their children’s anxious behaviors, the solutions are found in addressing their child’s thoughts. Children can be perfectly content when parents or teachers take over for them, and this can be the case with navigating their own thoughts. Have you ever had your child talk down about themselves and beating themselves up? Do they come to you and list off all kinds of reasons why things are bad and they feel bad? Without offering solutions or any kind of positives, your child starts to slump into themselves. This is when most parents and friends step in and offer rebuttals and arguments. We think we are helping our children see themselves positively. While it can be helpful at times to state the case for optimism and positive thinking, for children experiencing anxiety, this is actually a way of regulating their feelings through you. Instead of speaking the truth to themselves, they passively come to parents and friends hoping that someone else can help them feel better. What’s the Worst That Can Happen? No Really? A child’s imagination can be a beautiful, fun, and creative place, but it can also be the place where thoughts get out of control and destructive. Without the right tools, children with anxiety can catastrophize simple problems into life threatening or life ending situations. First, they assume a negative outcome to a problem. Next, they jump to the worst possible chain of events. Then, they end up at a conclusion that is a catastrophe. Our clinicians specialize in the treatment of anxiety in children at our offices in Fort Collins. We offer counseling for children as young as 9 years old. Feel free to give us a call to learn how counseling or an evaluation could be helpful or to schedule an appointment. You can reach us at (970) 889-8204 or contact@coloradocac.com.